This plugin will allow you to deny specific User Groups from the download of attachments of Specific Type from Specific Forum without getting the "Min. amount of posts" acquired. The plugin will allow the downloading of attachments to only those who already posted / replied to the topic. You may select groups who can see / download attachments without replying. Plus "forums" where the plugin is functional. 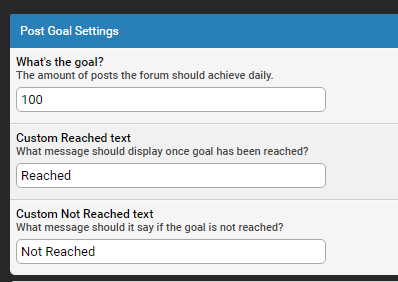 Set a daily post goal that your users should achieve on a daily basis.